THE LITTLE DANDY : What's Yo Style, Girrrl? In the spirit of Easter Sunday here's an outfit from last Spring (2012). Blouse & Bag thrifted. 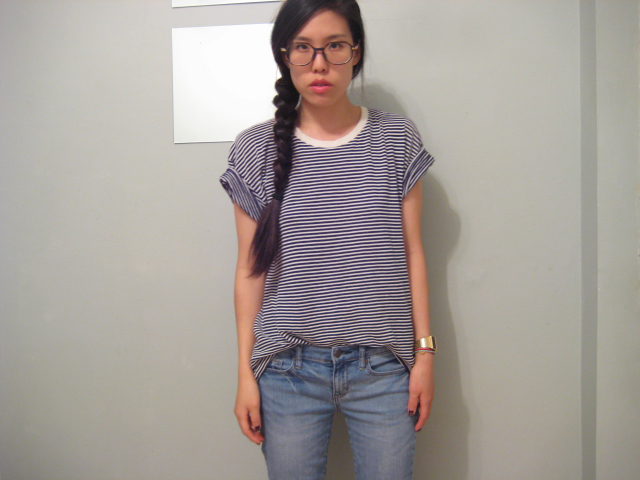 This week on HeartIFB they are encouraging bloggers to define their personal style. "What is your personal style?"....stumped? I, like possibly some of you, have always been kind of stumped by this question. NOT because I DON'T KNOW how to answer the question. I simply just wouldn't know where to begin. Since being confronted with the question today on HeartIFB, I thought to myself: "It's really about time I tackle this. I'm too old to ignore this age-frickin-old question!". My backside. Jeans from H&M. 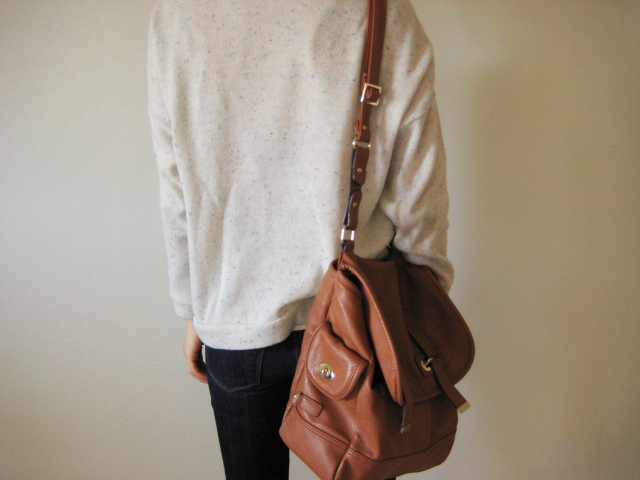 Sweater & Bag from Seoul street shopping. Full post here. Off the top of my head I would say that my style is quite simple & classic. I don't get too wild with my outfits of choice, and I've got pieces that I've been wearing time and time again for years without making me feel passé. But I don't feel like "simple & classic" really encompasses my personal style with an absolute complete-ness. Even looking at those words makes me feel uncomfortable. 'Simple & Classic' makes me think of pencil skirts and strings of pearls (both of which I don't wear often...or ever). So, we've gotta go a bit deeper. And I'm okay with that because I already know where this is going. I know that I have a largely hidden girly side (I can't help but LOVE flowers and everything pink), but I've also got a very dominant tomboy self (stilettos are not my friend, and what is a garter?). So now I can gather that my personal style is both simple & classic...and also an even mixture of girly-ness and tomboy pizazz. Alright. I'm good with this. If it were carved in stone, I would not fret. But there is still more! 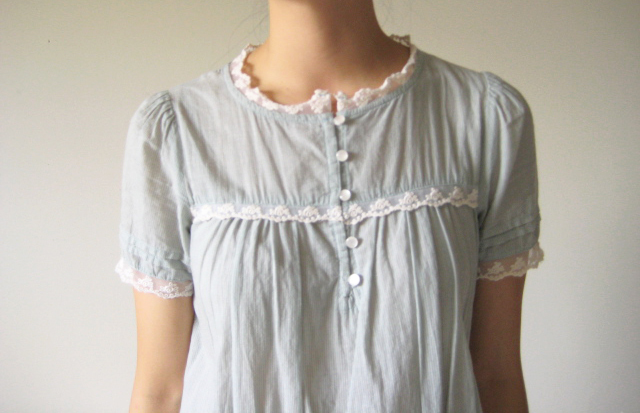 Adorable mint blouse from Seoul street shopping. Full post here. Simple & Classic indeed. Full post here. Let's just add one last thing to the mix---to the old-lady-tomboy mix. We must add that last thing that is of UPMOST importance: COMFORT. I need to be comfortable--always. There is no way in he** I'm leaving the house if something I am wearing feels uncomfortable, or if I am not comfortable with the way something looks on me. It always has to feel right. You'll notice that I favour oversized tops and flat shoes because I simply find these pieces to be super comfy. Heels & wedges? I can entertain the idea, but I'd much rather be in flats. A form fitting top? Sounds like it could work for the first few hours of the day, but I'm not sure I want to see how that pans out after my big lunch. Floral & Loafers. Full post here. Anywhoots, Heart IFB was kind enough to provide some fun questions that could help us understand our personal style a bit more. I'm going to go ahead and answer these in this post...because I can (this is my blog after all). Who are you style icons? When you put outfits together, who’s style do you envision? Your friends, celebrities, bloggers, movies? I definitely have a handful of style icons, none of which are friends or bloggers. Age old style icons would have to be Audrey Hepburn (duh) and Edie Sedgwick. Fast forward to now, I have always loved MK Olsen, Nicole Richie, and Kate Bosworth (that girl looks so cool always). More recently I've been stying away from Celeb gossip & pap photos. I've been getting style inspo from online shopping sites! I love StyleNanda and The Whitepepper. Perfection <3. What is your lifestyle like? Ultimately, we dress for the lives we live. Do you live in the concrete jungle, or do you spend afternoons on a yacht? I live the 'concrete jungle' downtown life of Toronto, ON. No afternoon yachting...unfortunately. How does your environment affect your style? The weather definitely takes a huge part in affecting my style. I find myself pretty uninspired in the colder season. I hibernate like a bear in giant sweaters and boots. I'm sure moving to Cali would fix this. Where else do your inspirations come from? As mentioned above, I've been most recently inspired by online shopping sites (not typical, I know). I also definitely get inspired by movies (the new Gatsby flick coming out? Eye drooool!! ), music and places...mmm Paris (not that I've ever been =P haha). And that is that. I suppose I am a very comfortable old-lady-tomboy =). Question answered? Yes. Easy to explain? I hope no one ever asks me this question ever again. In an effort to save time and avoid awkward explanations I would rather just say, "Hmm, not sure.." and walk away -- HAH! Thanks for reading me through to the end! And enjoy what's left of your weekends =). 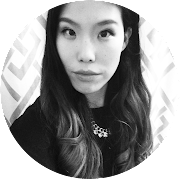 Labels: clothes, fashion, heart IFB, ootd, style, thrift, vintage, what is your style?